Nothing says comfort food like a pot pie. Warm and filling, a Winter Vegetable Pot Pie is a twist on a classic that features this season’s finest produce. Now is the time to enjoy root vegetables like parsnips, carrots, and potatoes. These cool weather-loving vegetables are at their best this time of year. Also, in season are winter squashes. Combine a medley of these vegetables together and you have the makings for a delicious and satisfying pot pie filling. When making a winter vegetable pot pie, I use carrots, parsnips, potatoes, butternut squash, and onions. I also throw in some frozen green peas for color. Sweet potatoes, turnips, and celery root are examples of other root vegetables that would be delicious additions to a pot pie. Many recipes call for roasting the vegetables before adding to the pie, but that can be time consuming. Simply boiling the vegetables until fork tender does the trick for me. Whether roasting or boiling the vegetables, the key is to make sure your sauce is well seasoned. If serving pot pie for guests, you might want to consider making everyone their own individual pot pie. It makes for a nice presentation when serving. You follow the directions just as you were making a traditional pie, but instead place the filling in individual ramekins. The only difference to the recipe is that you may need a little more pie dough based on how large your ramekins are. 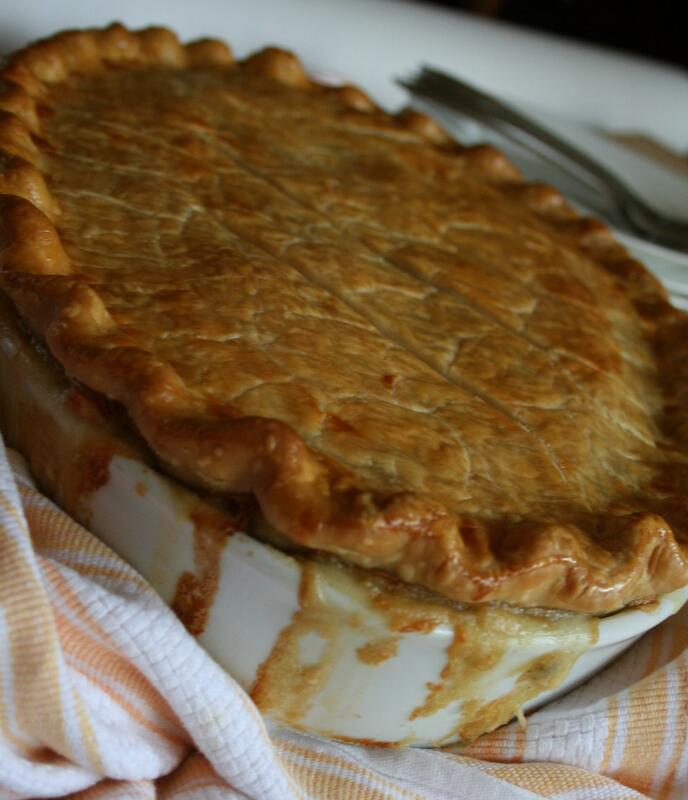 Besides being delicious, another wonderful thing about pot pies is that they can be made a day in advance. If doing so, either top with the pie crust just before baking or make sure the pie filling is completely cooled before topping with the uncooked pie crust. Fill a medium saucepan with water and bring to boil over high heat. Add the carrots, parsnips, potato, squash, and peas and cook until crisp-tender, about 8 minutes. Drain well and set aside. In a Dutch oven or large saucepan over medium heat, melt the butter. Add the onions and cook until softened, about 5 minutes. Lower the heat to medium-low. Add the flour and whisk until the mixture is golden brown, about 4 to 5 minutes. While continuing to whisk, gradually add the milk and the stock. Add the thyme and season with salt and pepper to taste. Bring the mixture to a boil over medium-high heat. Reduce the heat to medium-low and simmer, whisking constantly, until the mixture thickens, about 5 to 8 minutes. Add the carrots, parsnips, potato, squash, and peas. Stir to combine. Adjust the seasonings as necessary. Pour the filling into a 9 x 13-inch baking dish. On a lightly floured surface, place the two pie crusts on top of each other. Roll the dough until it is big enough to cover the baking dish. Place the pie crust over the top. Flute the edges, if desired, and cut slits in the top for steam to escape. Brush the crust with the beaten egg. In case of overflow, place the baking dish on a rimmed baking sheet. Bake until golden brown and bubbling, about 35 to 30 minutes.